A typical electronic tuner has built in error (equal temperament) essential for pianos. Not so great for string instruments that rely on perfect fifths for proper resonance (the string bass utilizes perfect fourths). With the four strings of the violin tuned to equal temperament, the instrument will be in tune with the piano but it’s acoustic properties will be compromised. The sound will not ring with sympathetic vibrations. Two suggested tuner hacks were offered for the violin (see below). If someone knows of something similar for the viola and cello, please speak up here since I could not find anything. @BillyG . I got flustered trying to add the attachment to the above post, and you came in before I could complete. No harm done. I am sure that I could figure out the viola and cello tuner hack if I could look at the overtone frequency spectrum using something like audacity. Another thing to learn. With the four strings of the violin tuned to equal temperament, the instrument will be in tune with the piano but it’s acoustic properties will be compromised. The sound will not ring with sympathetic vibrations. Violists and cellists do this routinely, though usually by listening to the fifths instead of with an electronic tuner. We learn to tune to "tight fifths" which are essentially a compromise between equal temperament and perfect fifths. If we don't, the viola and cello C string will sound out of tune compared to a violin E string. The human ear can hear a difference of about 6 cents. Because the perfect fifth differs from the equal temperament fifth by about 2 cents, we can't really hear the difference within a single instrument, but it becomes apparent (at 8 cents difference) when we add the C string. When tuning "tight fifths" by ear, it still sounds a lot like a perfect fifth, but there's a certain qualitative difference in the sound. Quantitatively, I can say that my C string is 3-4 cents flat on the electronic tuner instead of the 6 cents you would expect from tuning to perfect intervals. This means my "tight fifth" splits the difference between just intonation and equal temperament approximately in half, with slightly over 1 cent difference from equal temperament for each fifth. Whenever I'm not sure (for any reason from ambient noise to having a cold), I use a tuning app that shows cents and aim for 1 to 1.2 cents difference per string. @AndrewH and others. I am directing this thread more for the student willing to pay serious money for a good acoustic instrument or an experimentalist such as myself, than a practicing musician. I want to do everything I can to induce resonance and I was frankly shocked to learn that my reliance on electronic tuning was impeding the process. FYI, my violin teacher gently, LOL, suggested I download "TE Tuner" on my phone and actually use it on occasion! I just checked and it seems to have a toggle in the upper left corner for 14 different temperaments... all yours (and a metronome) for $3.99. 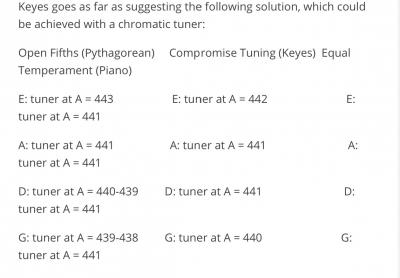 @Irv, I was essentially trying to reverse-engineer the "tight fifths" from my perception to the electronic tuner. As I noted, there are situations where I can't hear the compromise interval clearly enough, and so I use the electronic tuner: the D string is tuned to D minus 1-1.2 cents, the G is tuned 1-1.2 cents farther flat than the D, and the C is tuned 1-1.2 cents farther flat than the G.
I notice that this tuning resonates quite a bit better than equal temperament -- in fact, for the first day or two after I change my strings, the sympathetic vibrations are so strong as to be irritating even though they're not tuned to pure intervals. I try to get my strings as close as possible to being 'in tune' (which I take as being beatless 5ths) but in all honesty, since as soon as I put a LH finger down it goes all to pot, I wonder if it's really worth worrying about fractions. I have just discovered that my Korg can tune Pythagorean, mean tone, Werckmeister III, Kimberger III, Kellner, Vallotti, and Young. I assume that I want Pythagorean. I also assume that what AndrewH was talking about was one of the remainder. Wow, completely 100% over my head. The knowledge of music that you guys have is astonishing. I wish I had a clue what you just said. I retuned my violin and cello last night to perfect fifths using Pythagorean method. I quickly found that the Peterson strobe was not going to work since it takes a long time to react and my bowing was not consistent enough to settle down the meter. I went on line to get a copy of the user guide for my Korg (which has been out of production for several years). It had me calibrate the meter’s indicating needle (easily done) and guided me through the many features of the tuner to the one I wanted. It is quite unsettling to find that your violin g string setting under temperament is about a semitone sharp to the perfect fifth g. Deviations of the other strings were less, but still different (even the a string, which is a mystery to me). Inter-string resonance was immediately heightened after tuning by perfect fifths. I was concerned about my intonation but adapted quickly and the notes sounded much more natural. A side bar for those expressing a sense of loss regarding tuning methods. Temperament tuning was introduced during the days of Bach when keyboard instruments became popular. Slight errors were introduced so that various scales could be played that were pleasingly processed by the brain of the hearer. The physics of string instruments more naturally reside with perfect fifth tuning. The bottom line is if you are electronically tuning with an inexpensive device (or were like me and had the feature available on your tuner but did not know how to access it), you are robbing your instrument of much of its available resonance and impeding you processing of natural intonation. My highlighting above..... Ummm, do you mean the A "deviated from being a full 5th apart" from the D ? Thrust me - I'm just as confused. Because for perfect 5ths - well - don't they have to be relative to something ? Oh, I'm struggling with this - hang on - right - we need a reference - the reference should be ( well, it can be anything you want, really ) - I'll start again. Precisely ! Excellent ! The instrument comes alive, doesn't it ? @BillyG . You are likely right on the observation that my retuning one string caused a tone deviation in others. I thought that the a string would be unaffected by switching to tuning to perfect fifths, since the electronics were calibrated to a=440 herz. I had assumed (which is generally dangerous) that the given a=440 herz was from a different octave than the one I was using. Looking back, the effect was likely caused by string tension change by loosening the g string. The standard of using a=440 herz was instituted circa 1940 and some instruments benefit in tone from using a lower number. It quiets them down as well. This tip is only useful if you do not play with others. Ohhh, cool @Irv - yeah - I was struggling to understand.... No prob at all ! I hacked the cello for cid on another thread. I thought that I would post it here as well. c (a=438 herz), g (a=439), d (a=439), a (a=440). If you want to diminish sound output and/or wish to lessen finger strain on your left hand, tell me what you want for the a string herz and I will hack for that frequency. This is so beyond me. Never heard of any of this from instructors. I don’t play with anyone, no other instruments, so I am not sure how this all applies. 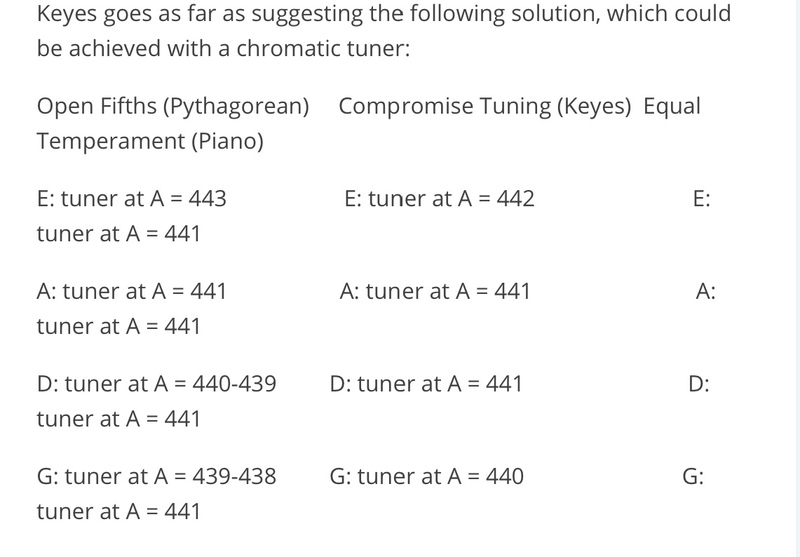 I keep asking what all this tuning to perfect fifths means, and have Googled it, but have never come up with an answer that makes any sense to me whatsoever. I was always told to tune this string to this note, tune that string to that note on the tuner. So this is so confusing and mind boggling. I was going to post this reply to the thread I started about looking for a quick response cello tuner, but it is more suitable here. I am getting such a headache. I always thought an A was an A. D was a D. G was a G. C was a C. Then their respective octaves. Not sure my tuners that I have show anything but lines before and after the letter for the note, so not sure how that relates to the lines on the tuner. I hope the Korg that I will order next month, will have numbers to give Irv’s work a try and see what the heck he is talking about. I alway use my ears for fifths but what I used to do with my students is suggest that they first tune the strings in their preferred way, for example a tuner, then play the fifths together to fine tune. Usually the difference is so slight that no one notices but if you are super picky, you might get bothered.